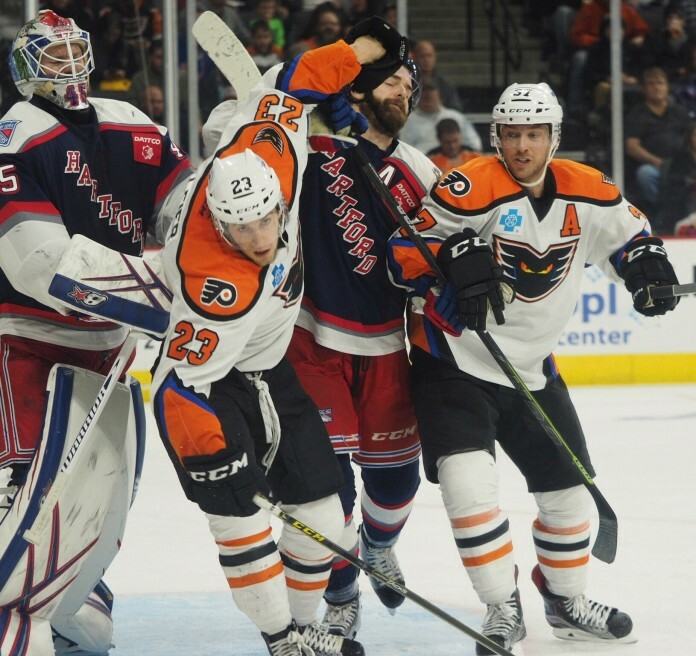 After dropping five straight games in back-to-back three game weekends, the Lehigh Valley Phantoms had one more chance at redemption Sunday in Bridgeport to avoid their first six-game losing streak since 2010 when the franchise played in Glens Falls, New York. The bounces and breaks the Phantoms weren’t getting in previous games didn’t seem to affect them Sunday in Bridgeport. Instead, they were able to finish their chances in a 4-1 win over the Sound Tigers – a team in a similar losing skid as the Phantoms were. The losing streak has taken a toll on the Phantoms’ place in the standings. They now sit in seventh place out of eight teams in the Atlantic Division with 34 games left on their schedule. For now, the win gives Lehigh Valley a chance to turn things around and make a push towards the postseason. Forward Taylor Leier is taking big strides in his second full season of pro hockey. After a 31-point, 73 game rookie season last year proved to be a learning experience, Leier has come into this year both confident and determined to take his game to the next level. Sunday in Bridgeport, Leier’s skill set was on full display. While on the power play, he was in front of the net playing his normal position on the man advantage. In the first period, he found a rebound in the slot and muscled his way to the loose puck in order to get the Phantoms on the board with his 10th goal of the season. In the second period, he turned a normal 2-on-2 rush into the offensive zone into a prime scoring chance – making a move and beating a defender on his way to the net. What a difference a year makes. A six-game stint with the Philadelphia Flyers – Leier’s first NHL appearance – has given him an increased sense of belonging in addition to the world of confidence he’s showing this season. The Phantoms (18-21-2-1) have just one game this week on Saturday night at the Giant Center in Hershey, Pa. against Atlantic Division rival Hershey Bears.